Lou Addie Aldridge Bailey, daughter of David Douglas Aldridge and Sarah Cathilee McMillon, married to Horace J. Bailey and buried in Elmwood Memorial Park Cemetery, Abilene, Taylor County, Texas. 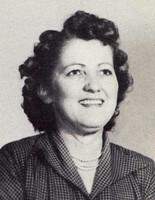 Lawn Independent School District High School Teacher (1949-1954). This Lady put up with the likes of Howard May, Charles Warford, Bob Satterwhite and the like for years and held their respect and admiration. Her family background aided in understanding high school personalities and she will always be a treasure.